Multilotto is one of the better lotto betting sites I’ve seen, with a wide array of virtual casino games to boot. I’m always hesitant about lotto betting sites, but Multilotto is one of the better options I’ve seen. Placing bets and keeping track of games is a breeze. Better still, you’ve got options like multi-draw bets, subscriptions, systematic forms, and even support for group play. Multilotto also offers an impressive range of virtual casino games---perfect for those times when you need a change of pace. Despite all these, however, Multilotto does have some drawbacks that keep it from being a top recommendation. There’s the relatively narrow selection of payment methods, as well as the limited customer support options. Plus, Multilotto seems to advertise more games than it actually lets you play. That said, if you’re interested in lotto betting, Multilotto is still one of the best websites to try it. Give it a look today. Launched in 2011, Multilotto lets you bet on the outcomes of lotteries from all over the globe. It’s owned and run by Curacao-based Multi Pay N.V., which holds a gambling license issued by the Curacao government. Aside from lotto betting, Multilotto also offers virtual scratch cards and virtual casino games. Multilotto is a lotto betting site with a hefty serving of online casino gambling on the side. When you play the lottery at Multilotto, you’re not participating in the official game. Instead, you’re placing bets on the outcomes. Any prizes you win will be paid out from Multilotto’s own earnings and/or successful claims made with its third-party insurance provider. Multilotto is a lottery betting site, so you’re placing bets on lottery game outcomes instead of buying tickets as an official participant. Multilotto uses Lotto Warehouse Ltd. as its bookmaker, and any payouts will be claimed from Lotto Warehouse Ltd.’s financial hedging partners. Solo play: You can buy up to 5 tickets for the current draw in one go. Group play: You can buy a set of tickets for your personal syndicate or lottery pool. Like many lottery sites, Multilotto also lets you buy ahead for multiple draws or subscribe to all upcoming draws indefinitely. You also get systematic forms, which let you get tickets that cover all the possible combinations for your chosen set of numbers. Multilotto joins our top-ranked sites theLotter and Lotto Agent as one of the few lottery sites offering this option. You can play with virtual credits or real money. To learn more about Multilotto’s wide game selection, read on! Multilotto has a relatively long registration form. Multilotto asks for quite a lot of information to start with. You’ll need to give your full name, birthdate, complete address, and even your mobile phone number. That’s all on top of your email address and preferred password, which are at least pretty standard. Once you register, you’ll be asked to top up your account. Multilotto only uses euros as the currency for transactions. Registered users can find the login button at the top of every page of the website. Multilotto occasionally offers deposit bonuses, free tickets, and free trial subscriptions. Multilotto lists 60+ lotteries in its selection, but only 22 of these seem to be playable. There’s something strange about Multilotto’s game selection. Sure, there’s a staggering amount of games available here: Multilotto’s page lists 63 lotteries in all. There’s a fantastic range of games here, from the blockbusters like the US Powerball or US MegaMillions to lesser-known games like the Finland Lotto or Multilotto’s very own Bitcoin Jackpot. However, only 22 of Multilotto’s listed lotteries have a “Play Now” button that redirects you to an actual purchasing page. The rest have a “Read More” button that leads only to basic information about the lottery. This isn’t a seasonal thing, either: many of the lotteries without “Play Now” buttons are active. I’m not sure what’s going on with Multilotto here, but it’s a little misleading to include so many lotteries that you can’t actually play. You can buy up to 5 tickets in one go. Multilotto lets you pick your own numbers, but you can also use the Quick Pick function to get a random set of numbers instead. You also have the option to use systematic forms. 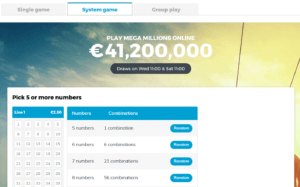 Multilotto is one of the few lottery sites offering this option: it lets you pick a set of numbers, and it places bets on all possible combinations of those numbers. For example, 7 numbers gives you 7 combinations, while 8 numbers gets you 28 possible combinations. Some games, like the US Powerball or US Mega Millions, have an additional Boost option. This functions like the multipliers sometimes offered for these lotteries, doubling your prize money if you win. Multilotto displays results for 56 different lotteries from all over the world. Multilotto reports results for all the lotteries it offers, as well as some extra games like the New Zealand Lotto Strike. You can view previous results as well as winner lists per prize tier. You can find the Multilotto results page here. As if 57 lottery games weren’t enough, MultiLotto also offers a very unique lottery draw in the form of Bitcoin Jackpot. As its name implies, Bitcoin Jackpot allows you to win as much as 1,000 Bitcoins. This unique game bases its winning numbers on Bonoloto draws so you know that the game isn’t rigged by Multilotto. Draws are held every day except Sunday, and it works just like any lottery game offered on the website. You can purchase entries for single games, group games, and system games, too. You can play 9 virtual scratch card games at Multilotto. Multilotto gives you the option to play with virtual credits or real money when it comes to scratch cards. Using virtual credits means you’ll only win virtual currency in return: you can use these to participate in more Multilotto games, but you can’t cash these out. Of course, virtual scratch cards are easy on the wallet even if you do opt to use real money. Most Multilotto cards cost a mere €0.50 or less, though there are more expensive cards (at around €1) that give you better odds. The mechanics for Multilotto’s scratch cards are the same as their real-life counterparts. Just get a card, reveal the underlying numbers or icons, and claim your prize when you get a match. Multilotto’s especially generous, because prizes can go as high as €250,000 depending on the type of card you buy. Multilotto offers a wide array of casino games for a refreshing change of pace. A whole section of Multilotto’s site is dedicated to various virtual casino games that you can play for real money. You’ll find slots, table games like blackjack and baccarat, and more. There are even live games of roulette streamed over the web. Of course, minimum bets and jackpot amounts vary wildly depending on your chosen game. You can opt to play with virtual credits, though any winnings will only go to your Multilotto virtual wallet and can’t be withdrawn as cash. Alternatively, you can play with real money—giving you a chance to score jackpots as high as €6,243,703 if you get lucky. All of Multilotto’s solo play games are available for group play, too. Multilotto’s group play option works a little differently compared to other sites. Here, you’re not buying shares to an existing syndicate that’s open to the public. Instead, Multilotto assumes that you’re buying tickets on behalf of a personal lottery pool or group. That’s why you’ll see a handy calculator that lets you select the number of people you want to split your syndicate tickets with. The calculator will then tell you how much each person owes for each share. MultiLotto’s group play system requires you to form your own group. To be clear though, the price per line is the same as a system entry. But because this is a group game, you’ll be splitting the cost with other people. The more people in your syndicate, the less each of you will have to pay. For instance, if you picked the maximum amount of numbers in a US Powerball syndicate entry, the total cost would be €5,544. If you were to find around 20 people, you’d only have to pay €277.20 each—less, if you can find more people. Definitely not. Multilotto has been in business since 2011, and it’s owned and operated by Multi Pay N.V., a gambling company that’s duly registered and licensed in Curacao. All lottery bets are placed through Lotto Warehouse Ltd., a lottery bookmaker that uses financial hedging systems to fund prize payouts. Yes, Multilotto is run by a bona fide gambling company called Multi Pay N.V. The company is based in Curacao, and it holds a gambling license from the Curacao government. Yup. Multilotto uses a 128-bit RapidSSL encryption to secure all transactions and information on their website. Is Multilotto a real or fake company? Multilotto is owned and operated by a real company called Multi Pay N.V. It’s duly authorized and regulated by the government of Curacao’s gambling commission. The Curacao-based company Multi Pay N.V. owns Multilotto. How does Multilotto make money? Multilotto doesn’t charge commissions for your winnings. Instead, it earns from the handling and processing fees that are tacked on to each purchase. Yes, Multilotto is legal. It’s regulated and licensed by the Curacao government’s gambling commission, so you know you’re in safe hands. Does Lottery Critic Trust Multilotto? Yes. Multilotto holds an up-to-date gaming license from a government gambling commission, which means it undergoes regular inspections to check compliance with established gambling laws. While Multilotto’s 128-bit SSL encryption could be stronger (many lottery sites use bank-grade 256-bit SSL encryption instead), it’s still a good step towards securing the information transmitted and processed through its website. Multilotto pays you directly—no need to claim anything in person, even jackpots. Multilotto’s lotto betting system means it doesn’t depend on the official lottery operator for prize money. That has its pros and cons. On the one hand, you can get all your winnings credited directly to your account. Yes, even jackpots! No need to claim a physical ticket and travel to a lottery operator’s office to get your prize money. This is incredibly convenient, especially if you’re playing lotteries from different countries. On the other hand, Multilotto’s prize payouts come from the third-party financial hedging institutions used by its lottery bookmaker, Lottery Warehouse Ltd. As you can imagine, claiming huge jackpot sums can be quite a process. Multilotto’s own Terms and Conditions state a waiting period of up to 90 days — 3 whole months — before jackpots or second prizes get credited to your account. Multilotto only supports 12 payment methods. You can withdraw winnings by requesting a payout from your account’s dashboard. Multilotto requires that you use part of your account funds to pay for any Multilotto services. Otherwise, you’ll need to pay a 5% administrative fee for your payout request. Multilotto uses the same payment methods to give you your payouts, if possible. If you chose a method that doesn’t allow Multilotto to transfer funds to you, Multilotto uses bank transfers instead. All withdrawal requests are processed within 3 days of being received and acknowledged. Has anyone won on Multilotto? Multilotto’s homepage displays a running tally of its total payouts. 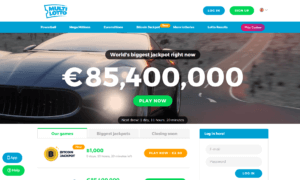 Currently, the site claims to have paid €275,942,154 in total winnings across all its lottery betting and casino games. Multilotto doesn’t provide details about its biggest payouts, though. Multilotto offers dedicated mobile apps for both Android and iOS. 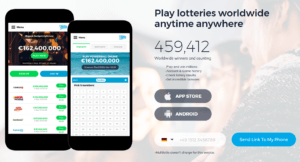 Multilotto offers a full-featured mobile app that lets registered users check results and place lottery bets directly from their mobile phone. One thing to note, though, is that the Multilotto site leads you to a direct download of the Android APK instead of installing the app through Google’s Play Store. If you’re not confident about non-Play Store-facilitated installations, you might want to stick to Multilotto’s mobile-responsive website. Multilotto has limited customer support resources. You can reach Multilotto’s support team through email. That’s it. This is a bit disappointing since you don’t have alternatives if you need urgent assistance. LottoPalace also has a short FAQ, which is another letdown. Most of the information here is background information on each lottery. While that’s appreciated — especially for beginners — it falls short. There are a few rudimentary answers about how aspects of the site work, for example, but nothing more. Multilotto sticks to the usual lottery website formula. There’s not much that differentiates Multilotto’s website from other lottery services on the web. That’s both a good and bad thing. On the upside, you’ll have an easy time navigating to important sections like lottery results pages. On the other hand, though, Multilotto’s overall design can feel a little tired. I have to give Multilotto props for its language options, though. You can switch between 16 different languages, ranging from German and Russian to Magyar, Chinese, and Tagalog. Multilotto is one of the few lottery sites I’ve seen with decent support for Asian languages on top of the usual European options, so kudos for that. It’s extremely easy to place bets on Multilotto’s site. There are quick-purchase buttons available just by hovering on items in the navigation bar. You can also jump to any lottery you like from Multilotto’s game listings page. The purchase page itself sticks to the usual template: you can pick numbers, opt for Quick Pick, and sign up for multi-draw or subscription options. I do appreciate Multilotto putting solo play, systematic forms, and syndicates on the same page. It’s incredibly convenient to simply toggle between their tabs without having to hop to a different part of the site. It’s a small detail, but it’s so useful, I wish more sites would follow Multilotto’s lead. Multilotto also offers features to address gambling addiction. In your account dashboard, you get several options, the first of which allows you to set daily play limits so you don’t go overboard. You can also set account timeouts so you won’t be able to play, deposit or withdraw during pre-determined periods. You can set your account to timeout for a day, a week, and a month. Or you can set a custom duration that can last up to 179 days. If you feel you need heavier restrictions for yourself, you can use the self-exclusion feature. This works almost the same as timeouts, but durations are longer here. You can self-exclude for 6 months, a year, 3 years, or even 5 years. Finally, if you fear gambling addiction is getting ahold of you, you can activate permanent exclusion. And yes, it works exactly as it sounds. If you permanently exclude your account, this means that you won’t be able to reactivate your account under any circumstances—nor will you be able to create a new one using the same login credentials. As such, it’s important to withdraw any winnings you might have in your account or use up any money you have deposited before activating permanent exclusion. Multilotto offers an impressive range of games and convenient features, but some issues pull down its score. Multilotto is a great place to start if you’re interested in lotto betting. The registration process can be a bit tedious, but the long list of available games more than makes up for it. An equally wide-ranging list of language options makes this a website well-suited for international audiences, too. Unfortunately, that doesn’t extend to Multilotto’s payment methods or working currency. You can only transact in euros here. Plus, any payouts could take longer than usual: up to 90 days for jackpots and second prizes, in fact. Multilotto goes a long way towards reducing my skepticism towards lotto betting sites. It still has some notable shortcomings, but it’s definitely worth a shot.